India's first indigenous built nuclear submarine 'INS Arihant' has successfully completed its first deterrence patrol and returned back on 5th November 2018. PM Narendra Modi on the occasion lauded Indian Navy officials and also dedicated this feat to the citizen of India. Earlier, 'INS Arihant' has successfully passed several deep sea diving drills as well as weapons launch tests. It was commissioned in August 2016. 1. INS Arihant is a nuclear submarine capable of carrying nuclear-tipped ballistic missiles known as Ship Submersible Ballistic Nuclear (SSBN). 2. INS Arihant was already equipped with Mirage-2000 and Agni Ballistic Missile. 3. INS Arihant is the first such submarine in the country, whose firepower is under water, land, and surface water. 4. INS Arihant means the destroyer of the enemy. Arihant's capacity ranges from 750 to 3500 km. 5. INS Arihant’s design is based on the Russian Akula-1 class submarine. It is a 6,000-tonne nuclear-powered submarine and is 112 meters long. 6. 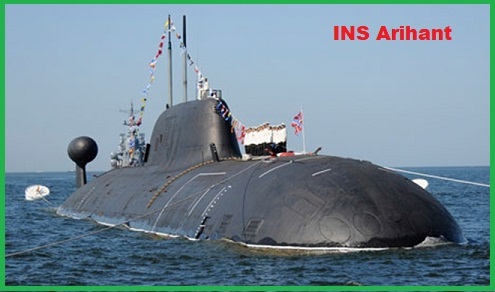 INS Arihant is powered by 83 MW pressurized light water reactor built with Russia’s help. This reactor generates tremendous heat, driving a steam turbine. 8. INS Arihant has made India 6th country to have a nuclear triad i.e. capable of delivering nuclear weapons by aircraft, ballistic missiles, and submarine-launched missiles. Other countries having nuclear triad are Russia, the United States, the United Kingdom, France, and China.